Upon graduation from law school, Mr. Ferguson worked as an associate of two large insurance defense firms, first in Daytona Beach and subsequently in Orange County. Mr. Ferguson gained vast experience representing insurance companies and their insureds in all types of personal injury, wrongful death and insurance litigation cases. From 1990 to 1997, Mr. Ferguson opened his own firm expanding his area of practice to include Personal Injury, Criminal Law, Family Law, Wills, Estate Planning, Trusts and Probate. From 1997 to 2003, Mr. Ferguson left his law practice to accept a position as chief executive for Rankin-Patterson Oil Company in Asheville, North Carolina. As a chief executive for a multimillion dollar business, Mr. Ferguson gained an in-depth knowledge and understanding of the importance of protecting your most valued assets in the divorce and estate planning process. In 2003, Mr. Ferguson returned to the Ormond Beach to join his sister, Katherine Woodard in private practice. Mr. Ferguson’s business acumen and vast experience in Personal Injury, Wills, Estate Planning, Trusts and Probate are an asset which expands the areas of service the firm of Woodard and Ferguson provides. 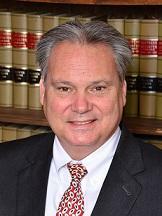 With 30 years experience as practicing attorney, Mr. Ferguson has represented thousands of clients in Volusia, Flagler, Orange and Seminole counties with Criminal Law issues. Member of the Criminal Defense Section, he is well-versed in all areas of Criminal Law, be it DUI, misdemeanor or felony violations, and is a fierce advocate for his clients. Mr. Ferguson’s divorce and family law experience includes all areas of family law, specifically, Divorce in Florida; Mediation; Division of Marital Assets and Marital Liabilities; Equitable Distribution of Business and Professional Practices; Retirement, Pension and Investment Accounts in Divorce; High Asset Divorce; Alimony; Injunction/Domestic Violence Injunctions; Paternity; Child Custody; Child Support; Relocation of Minor Children; Modification and Enforcement; and, Prenuptial Agreements. As a member of the Family Law Section, Mr. Ferguson is experienced and prepared to advocate for your personal family law issues. Mr. Ferguson is proud to be a member of the Ormond Beach/Daytona Beach area. He is an active member of the Ormond Beach Downtown Rotary Club, Ormond Beach Chamber of Commerce, and Preferred Business Network. He is an active Mentor for Volusia County Schools. Mr. Ferguson is the past President of the School Board for St. James Episcopal School.